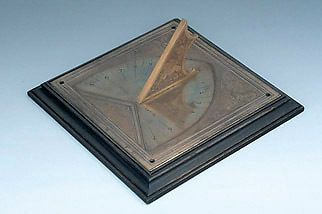 This is the most familiar form of sundial: a horizontal dial for a single latitude, with no pretensions to other functions or the slightest claim to universality. While this type of instrument represents the limit of most people's familiarity with the sundial today, it is interesting to note how rare such a simple instrument is from the medieval and renaissance period. In this case, any ambition to be more than absolutely straightforward is found, not in the instrument's geometry, but in the decoration of plants and exotic birds on the plate and gnomon. The signature, which occurs twice, is a monogram used by the Munich clockmaker Hans Koch. The decorative elements on this dial and the general character of the metalworking are reminiscent of contemporary clock-making.